From humble beginnings in the dorm room of a Florida college student, HostGator has grown into one of the largest hosting companies in the world. There is a reason for it, and it starts with their impressive list of features and options. They offer packages that are attractive to small businesses, individuals and Fortune 500 companies. Because of their top tier data centers, they can offer a 99.9% up time guarantee to their customers, backed with around the clock monitoring and security. They have received high marks, with a 90% recommendation rating in customer surveys conducted by a third party. All plans include an impressie list of features and include shared and dedicated hosting as well as VPS. Life is good here, come to this host and you will be happy too! They are good at everything pretty much. I would recommend them. All is well at the gator and I would certainly recommend you move here. Their support is great and the accounting dept shoots straight, what else do you need? 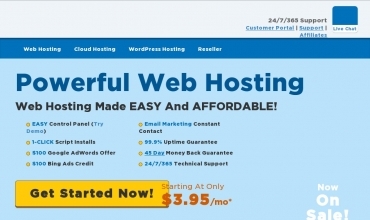 Try hostgator, they have been consistent for my business, so no real complaints. They are steady and stay ahead of the business which makes them successful in my eyes. Check 'em out! I am not a beginner with having websites. I have been doing this for over 15 years, which in computer time is a lot. My websites that I switched over to host gator are not down very often. I have had the joy of talking to people that speak my language(English) when I needed tech support. They also had a good understanding of what my problems were when I had them. If you have the choice, pay a little more instead of having to deal with all the headaches. The up time was OK and I was pleased with how quickly my technical issues were resolved.. The Cpanel worked well for what I needed. For 5 years I was happy with my service. I did have some serious trouble though after I made a mistake myself. I mistakenly created a few accounts and was not able to delete them. That should not have happened, so was the first big issue. They have my creidt card on file and instead of allowing me to delete these mistaken accounts they charged my card. I went back and forth with tehm over this iwas promised a part refund of the charges. It took almost a month to even get that. Using their plexk panel was way to difficult. I was not happy with the windows hosting service. They have so much cotrol and it makes things hard to get done or get changed. My experience with hostgator has been generally fine, there have been issues but quick resolutions have helped. Everyone here seems to pull together for the customer so that's a good thing. I heard good reviews so I tried them. They are currently hosting my site but it looks like I have to switch. I constantly get database errors. Tech support says it is because their servers are busy and I have to upgrade my account. I have to upgrade and pay more because your servers are too busy? Maybe they used to be good but my experience over the past 6 months has not been good. I don't want to go through the hassle of switching hosts but it looks like they are giving me no choice.